Caco Pacific Corporation (CPC), located in Covina, California, was founded in 1946 and employs 130 people from diverse backgrounds. The company designs, fabricates, assembles, tests and ships a wide variety of high quality complex injection molding systems in its 55,000 square foot facility. The CPC products are manufactured and sold mainly to OEM companies throughout the world. Major toys and consumer products companies are key customers. In reviewing operating procedures, the company identified significant issues that were contributing to increases in the customer promised lead-time. The issues were in the sales, customer quoting, engineering design cycles and approval processes. These administrative processes took between 6 to 8 weeks from design concepts to customer approval and required multi-level approvals. Improvements in the scheduling system could reduce schedule bumping, provide accurate information and shop floor visual based scheduling company-wide. CMTC® facilitated a CPC project team in collecting data for the development of the Value Stream Map (VSM) to document the current operating processes. Once the map collected the baseline data, the team reviewed and validated the data for each process and made necessary corrections that would help the project team reach consensus. Once the project team approved theValue Stream Map (VSM), CMTC facilitated the identification of ideas that would drive future improvement activities (Kaizens). After the improvement activities were identified, CMTC worked with the project team and Caco Pacific management to prioritize activities, develop an improvement schedule and assign resources and responsibilities. The project started in May 2008 and was completed in July 2008. The team developed a company-wide Current State Map and a Future State Improvement Map from quoting to shipping mold products. Implementations of improvement activities were conducted over one year to accommodate workloads. Recommendations of improvements were successful to deliver products on-time, enhancing teamwork and communication throughout the company. A recent $3.5M customer order received by CPC in 2009 used some of the VSM process improvements. 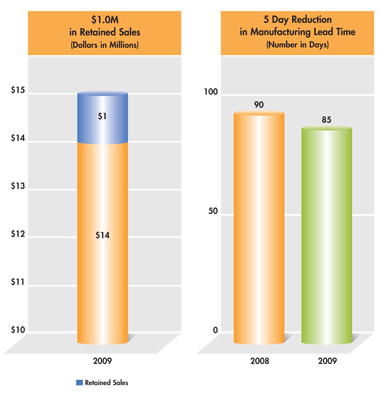 These improvements resulted in a 5 day reduction in manufacturing lead time. Caco’s 2009 sales would have been 6.7% less had it not been for the improvements.